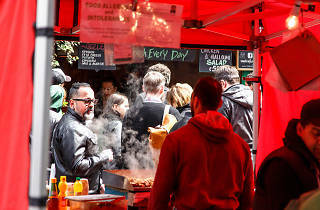 Linking the bustle of Oxford Street to the seductive scuzz of Soho’s ex-red light district, Berwick Street is one of central London’s most varied thoroughfares. Its place in history has been guaranteed since it appeared on the cover of Oasis’s mega-selling ‘(What’s the Story) Morning Glory?’ album. Back in the Britpop era, Berwick Street was home to so many record shops it was known as the ‘Vinyl Mile’. But the rise of iTunes and Spotify have ravaged it: now there are only a few remaining, though they’re well worth a rummage. What it’s lost in record retailers, however, Berwick Street has gained in a lively variety of coffee shops, restaurants and quirky clothes stores, all nestling next to the same fabric outlets who’ve been trading here for decades. At the Soho end, you’ll find the historic Berwick Street Market, a mainstay since the eighteenth century. Marc Bolan worked there as a teen, and it’s been smartened up but not sanitised (it recently saw off a privatisation bid). Shadowing it on one side, major renovation works are taking place: soon Berwick Street will have a boutique hotel, swanky flats and a row of smart retail units. In the meantime, there’s plenty to do here. If Berwick Street were a person, she’d be your favourite rock chick auntie: a little fancier than she once was, but still up for a good time. Delicious manaeesh (Levantine pizzas) from Tabun Kitchen. Lebanese-influenced rotisserie chicken at Cookhouse Joe, a cheap and cheerful hidden gem. Sizzling Szechuan chicken at Duck & Rice: Alan Yau’s lively hybrid of pub and Chinese eatery. Tasty Venetian small plates at Polpetto, a cosy outpost of the London-born Polpo chain. Chargrilled Iberico pork rib at buzzy tapas restaurant Ember Yard. Hefty Turkish gözleme, dished out every lunchtime from the front window of Med Cafe Soho. A flawless flat white from… Flat White, one of London’s first Antipodean coffee shops. A pint of real ale or a G&T at The Blue Posts, a cute old-school boozer and a Soho classic. Get a cooler hairdo than usual at B:Zar or Bleach London. Get yourself inked at One by One, a groundbreaking tattoo studio and gender-neutral streetwear store. An indie graphic novel from popular comic book shop Gosh!. A cushy new saddle for your wheels, from Soho Bikes. Pretty much any publication you can think of at Good News: it’s where Soho’s media types get their mags. Vintage vinyl and the latest releases from Sister Ray, which has shrunk in size but kept the quality high, and Reckless Records. Pre-loved fashion from Reign Wear, whose owners know the secondhand business backwards. Party supplies or your next fancy dress outfit from So High Soho, a treasure trove filled with wigs, costumes, fake beards and all sorts of accessories. Cloth from Borovick Fabrics , a family-run shop that’s been in Soho since the ’30s. Alexander McQueen shopped here as a student. Have a browse at Berwick Street Market. 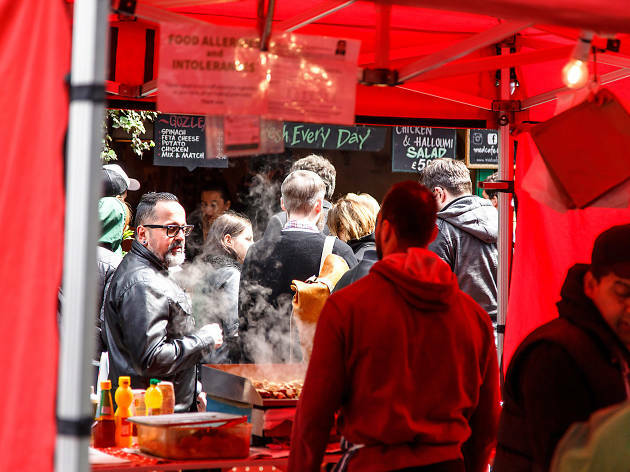 It has a mix of ace food stalls, traditional fruit, veg and flower sellers, and the excellent Soho Dairy, offering milk and cheese from indie farmers. Now discover more of London’s best bits.